Another year, another time for cards to get Rotated out of Standard. Sometimes, the cards we lose are of great significance and impact, and other times they don’t seem like much. But sometimes they’re the cards that weren’t always used but that we see all the time that will ultimately be missed the most. Super Rod is a pretty powerful Item card that offers recycling towards basic Energy and any Pokemon cards in your discard pile, putting them right back into the deck. This combos particularly well with searchers for Energy accelerators and the various Poke Balls to grab just what you needed – provided it was in the discard pile. Not every deck wanted to run Super Rod, and not every deck needed to run Super Rod, but for those decks that could take advantage of it, it was an absolute asset to them. Recovery is a major part of the game sometimes, and while you might prefer in some decks to just grab the Energy right out of the discard pile, we haven’t had a whole lot to deal with any Pokemon that end up in there. And for something as simple as that, Super Rod was just good enough. It’s been around since Noble Victories, sticking in with reprints in Dragon Vault and, more recently, in BREAKthrough, but for the time being, it’s time to say goodbye to one of the best recovery cards in the game. Your cards are at the mercy of Lysandre <Prism> now. Arora Notealus: I think my own use of Super Rod was done to get Energy back from the discard pile so I could draw into it with Juniper/Sycamore and power up my Black Kyurem-EX’s Black Ballista with it via Blastoise’s Deluge. Kind of a classy combo, but there it is! Side Reviews: Noibat – he’s primarily a tech in Garbodor decks, so as long as Garbodor is a big thing in the game, Noibat will likely see a little play in such decks. I don’t expect every Garbodor deck to run him, but I suspect if there’s a slot available, he’ll be occupying it. Lysandre <Prism> – definitely a stronger option now that the opponent can’t cycle back Pokemon, but not quite that strong against the Energy match-up. Unless your opponent is actively ditching Energy ala Alolan Dugtrio, you’re likely to need some more firepower in your Fire deck. Ultra Recon Squad – still some of the best draw support for pure Ultra Beast decks, I suspect that once more Ultra Beasts come out and the deck solidifies itself as an archetype to be run, you’ll see this card show up a lot more. Not at too many copies, but maybe at one or two. Super Rod would’ve been great to retrieve discarded Ultra Beasts! Next Time: Power up to the next level! Yup, lots of cards are going to leave Standard, and I even had my personal list of 35 cards that I think will be missed. Spoilers, but this top 10 does not contain EX, Mega Evolutions, or Break Evolutions, since they did not make the top 10. Since the highest placement for an EX is 15th place, It’ll probably be in runner-ups. Without further ado, lets take another look at those remaining memories! 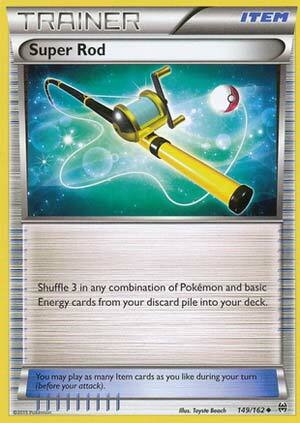 Super Rod has been with us for quite a long time, releasing all the way back in Neo Genesis up until XY Breakthrough. The Neo Genesis print had a different effect text while the Noble Victories version onwards has their own effect text. The old effect was to flip a coin. If heads, put an Evolution card from your discard pile into your hand, and if tails, you put a Basic Pokemon from the discard pile into your hand. I think this would be pretty unreliable if they kept that old effect. The Noble Victories effect is to put 3 of any combination of Pokémon and/or basic energy cards from the discard pile onto your deck. -Energy Recycler recovers 5 Basic Energy cards. -Brock’s Grit recovers six of any combination of Pokémon and Basic Energy cards. Some cards recover more cards than Super Rod, but they only support one category or the other, and some cards use up your Supporter for the turn. Super Rod comes close to being flexible than any other cards and can be used as many times as you like. With Super Rod gone from Standard, decks will need to run one of each items to recover such cards. Energy Recycler and Rescue Stretcher seems like an appropriate replacement. As for Expanded, Super Rod will continue to see play, but is nowhere as important as it once was…. …because of some shortcomings. Honestly, I have not thought about it until I read 21times review. When you use Super Rod, you are reducing your chances of getting the cards that you want when it comes to topdecking. The Supporter that you’ve could’ve got gets overwhelmed with Pokemon and Energy cards. Not to mention that it’s not likely that you’ll get those cards immediately. It seems that getting cards from the discard pile onto your hand is far superior than putting cards in the deck so that you can actually get to use them if situation recalls. That’s not to say Super Rod is bad, but competition of cards that does a similar thing or better tends to overshadow the older cards. Super Rod (BKT 149) returned to the format in the Breakthrough expansion set on November 4th, 2015. It had only a short hiatus from the meta, however, as it was Standard legal until the September rotation that year, so we were only without it for about a month. It’s had a good run, though, and was the eighth most popular Item played between May 19th and June 30th (data from decklists I compiled here). Many people liked carrying this card because it gave you options. The more options you have, the more chances you have to find a path to victory. To me, though, this was always the card that I loved to see people play. Most of the time when my opponent played this card, I knew I had the match in hand. “Why?” you ask. Simple: because Super Rod lets you put three cards back into your deck. Chances are you’re playing this towards the end of the game – sometimes it got played early and that’s ok, but most of the time people play it late when you only have a relatively small number of cards left in your deck. And that’s the problem right there. “Why is that a problem?” you ask again. “You only have a low number of cards left in your deck. That should make it easy to get them out.” Unfortunately, this is where the theorymon falls short. It’s the hardest to get cards out of your deck when you only have a limited number of cards remaining. Super Rod adds three non draw support cards to your deck. Chances are – at the end of the game – most of your draw support and ball Item cards are in the discard pile. If you have, say ten cards left in your deck, and two of them are Supporters, you have a 20% chance of top decking a Supporter. After playing Super Rod, however, that percentage goes down to 15% – from 1 in 5 to 1 in 7. All you did by playing Super Rod was decrease your chances of getting a draw support card, essentially meaning you’ve moved those cards from one inaccessible pile to another. Think about it: we almost always (except for Tord in one match this weekend where he actually had zero cards in his deck and actually used Oranguru’s Resource Management to prevent himself from decking out) have cards left in our deck at the end of a game. This means that just because you move cards from the discard pile to your deck doesn’t mean you’re guaranteed to get them back out. You need to use other cards – ball Item cards or draw support cards to access them… cards you probably don’t have available to you late in the game. By thinking you’re saving a card slot in your deck by playing Super Rod, you’re actually reducing your decks liquidity at a time when you need it to flow the most. Now, there are exceptions, if you’re trying to prevent yourself from decking out or have a ball Item card in hand, or if you’re putting Tapu Lele GX back into the deck. However, more times than not, when you play Super Rod, you made it just a little bit easier for your opponent to beat you. Rescue Stretcher and Energy Retrieval put those same cards back in your hand. They give you the resources you desperately need exactly when you need them. Rescue Stretcher even gives you the option of putting three Pokemon back into your deck instead of taking just one Pokemon. Both of these cards are significantly superior to Super Rod. Rescue Stretcher is actually the seventh most common Item, and Energy Retrieval just doesn’t see a whole lot of play because there are so many Pokemon that can pull energy back out of the discard pile. Welcome to another Pojo countdown! This time, we look at what the review crew thought were the most important losses the Standard Format will be feeling after September 1, 2018. Getting back to Super Rod, you recycle Pokémon and/or basic Energy from your discard pile because you either specifically need those cards or you just need to pad out your deck (such as to avoid decking out). If you need those cards, you probably need them in hand, which is why cards like Rescue Stretcher and Puzzle of Time show up more often to handle this sort of thing. Rescue Stretcher can shuffle three Pokémon from your discard pile to your deck or it can add one to hand; it doesn’t do anything about basic Energy cards, however. Puzzle of Time adds any two cards from your discard pile to your hand, but you’ve got to simultaneously play two copies of Puzzle of Time to do that. If you only need basic Energy, then Energy Retrieval (with its modern effect) lets you simply add two basic Energy from your discard pile to your hand. With the pacing of the game, you can see how this sort of instant reward so often crowds out Super Rod. For that matter, not all decks are going to worry about recycling Pokémon or basic Energy, so those decks don’t need Super Rod, either. Would Super Rod be better if it gave you the same option of three to the deck or one to the hand that Rescue Stretcher offers for Pokémon and the soon-to-be-reprinted Energy Recycle System offers for basic Energy? Sure, but then those two cards would have no real reason to exist. We’re losing Brock’s Grit at the same time we lose Super Rod and Puzzle of Time, so it looks like we’ll soon have to dedicate more space to recycling or just prioritize either Pokémon or basic Energy. We’re also losing some current, key Special Energy cards (well, mostly just Strong Energy) and the tricks to easily recycle Special Energy, so we may be in for a basic Energy dominated format. We’re losing N and Professor Sycamore, and I believe that will lead to heavier reliance on Ability-based draw effects, even more so than at the present time. Throw in the Magcargo with the “Smooth Over” Ability that allows you to pick a card from your deck and place it on top, and I’m thinking most decks are going to have reusable draw/search… which all chips away at the advantage running Rescue Stretcher with Energy Recycle System would have. The real reason Super Rod might not make much of a difference would be if lacking a huge source of discard and draw like Professor Sycamore just leads to a format where we aren’t running any recycling effect regularly. For those wondering, Super Rod took 10th place by amassing 66 voting points, which it gained by appearing on each individual list the three contributing reviewers submitted. For my own list, which ended up being a Top 35, it managed 13th place. A 10th place finish might be a bit high, but it is a good, general card.